What I would like to focus on in this post is what I ended with last month. 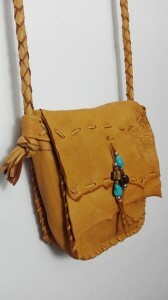 I had mentioned that a few months ago, even though fringe was all the current rage, we had designed a bag with NO fringe. That step was taken due to a number of subscriber comments asking for a more “simple” bag. Well… about a year ago we had made a major switch from machine sewing our bags to all handmade. We have had excellent response to that move so we created the Simply Soft Bag. All hand stitched of course. But we decided to “jazz” it up a little bit by using various shaped pieces of leather to give it an even more rugged look and “feel”. That has proved to be a wise move. The bags, small, medium and large, are the same sizes as our perennially popular Taos purse. No fringe. No sculpted or feathered leather. Just a couple strands of beads to cover the little bump caused by the magnetic snap under the front flap. The bag uses less leather and is faster to make. Thus we are able, for now, to produce them at a much lower price. Although we introduced them at the retail level such as this site we also have a wholesale division. Some of our more courageous wholesale clients decided to give them a try. Ordering just one or two. Then a few weeks later we get “send us four more”. Ok! That is a good sign. Then, the last few weeks, it is “Rush Order”. Send one in every color! One large, one small and the rest medium. And not just from one wholesale client. Not just from the USA. But from Europe, Asia, and Australia. Now it is getting exciting. It seems we have another winner on our hands. It has the same round four braid straps. Our standard two-inch gusset. 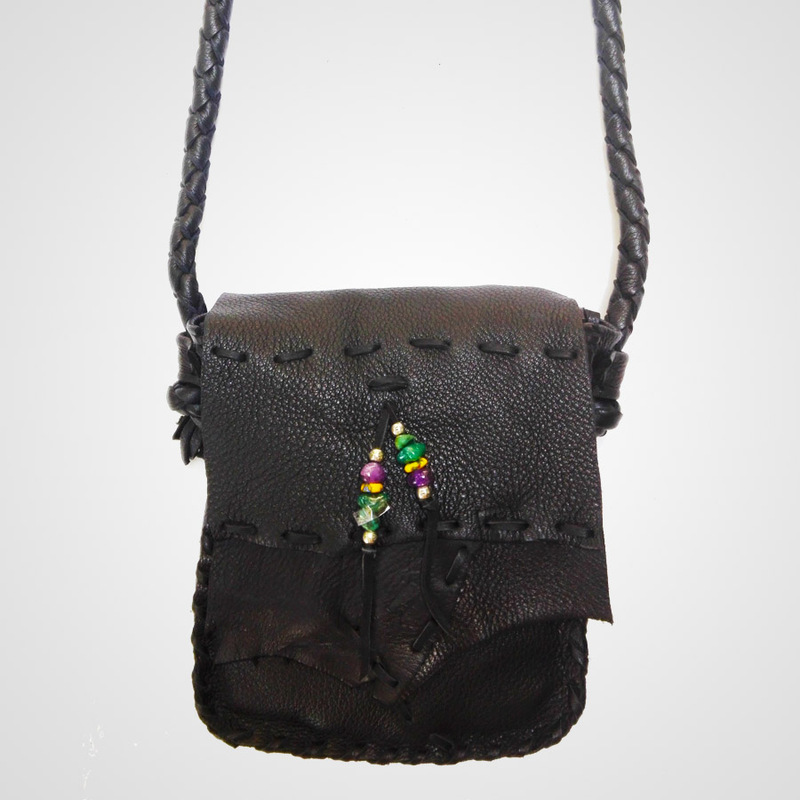 A large single pocket inside and your choice of bead color on the front flap. And of course made from the same buttery soft Colorado deer hide available in seven different colors that we have always used. Starting at just $47usd for the small to $67 for the large it is obviously a great buy. If you are a current subscriber to our newsletter use your special discount code to get your standard 20% off on this and any of our products. We are trying to build inventories of mediums in the three most popular colors. Tobacco (chocolate), Dark saddle (brown) and Saddle (Tan) so there should not be a long wait if you place an order now. So if you’re interested in this fun new bag, click one of the buttons below. To subscribe to our periodic newsletter to be the first to know about new products and specials click here to get the 20% discount code and a very exciting surprise for you. To get FREE samples of a few of our products and just pay $7.77 shipping in USA Click here. Cause you just “gotta feel” how buttery soft the leather really is. Will let you know what happens in a few weeks…….